What I love most about this time of the year is introducing comfort food back into our diets. It’s been cold and stormy for the past week here at the farm and I’ve found solace in the kitchen. This recipe is a wonderful one to whip up for a quick weeknight dinner or as a holiday side dish. The pork sausage in this recipe is seasoned with warming spices like cumin, cinnamon, and cloves. I tossed in some kale, cranberries, and toasted pecans which complimented the pork really well. 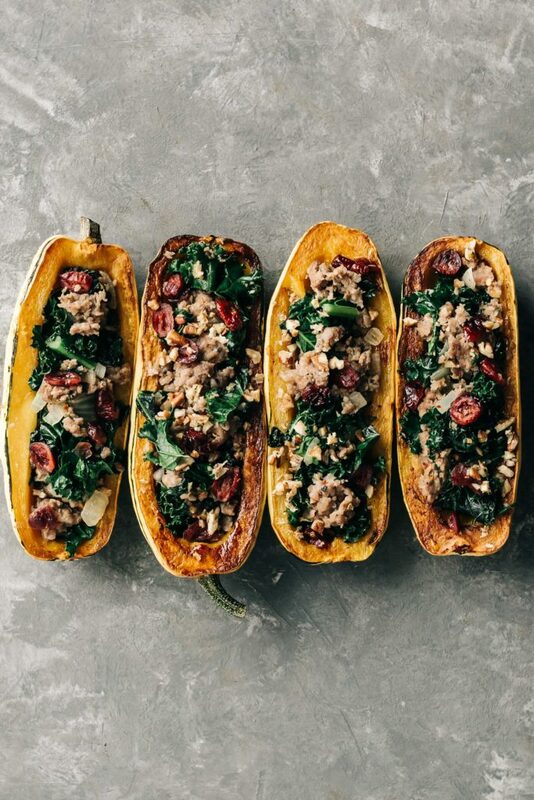 Served in delicata squash “boats” for the ultimate comfort meal. Each forkful had a nice balance of sweet and savory and I hope you all enjoy this dish as much as we did. You can use another winter squash if you cannot get your hands on delicata–acorn, butternut, or kobocha would all work just fine. Just keep in mind that the cooking times will very depending on the type of squash and the size. Happy comfort food season everyone! Preheat the oven to 425F. Drizzle each squash half with a little olive oil and place each squash cut side down on a baking sheet. Roast in the oven until the squash is tender, about 25-30 minutes. Cooking times will very depending on the size of your squash. Heat a little olive oil in a large deep skillet over medium heat. Add the onion and cook, stirring often, until translucent. About 5 minutes. Add the garlic and continue to cook for about 2 minutes longer. Add the pork, spices, salt and pepper and use a wooden spoon to help break up the meat. Continue to cook, stirring occasionally until the meat is cooked through and no longer pink. Add the kale leaves and continue to cook until the kale turns bright green and becomes tender, about 5-8 minutes longer. Stir in the drained cranberries. Heat a small dry skillet over medium heat. Add the pecans and cook, shaking the pan often, until the pecans are golden brown, about 8 minutes. Remove from the heat and when cool enough to handle finely chop the nuts. Divide the sausage mixture between the squash halves (you'll likely have leftover filling) and sprinkle with the toasted pecans and a drizzle of pure maple syrup (if using). I went super super light on the spices. I had fresh cranberries so I simmered them first in a bit of honey and water for a few minutes. Bomb recipe! Toasty pecans are key. Great recipe! This was featured in my CSA newsletter. Our box had a bunch of lacinato kale and small sugar dumpling squash. The newsletter recommended sticking the stuffed squash back in the oven for a few minutes to warm everything up. This worked out well. I recommend putting a sheet of foil on the pan when roasting the squash – makes for easier cleanup. I found that my squash cooked unevenly and residual sugar on the pan from the squash I removed burned onto the pan.